One of my favourite things about the changing of the Seasons is an excuse to go shopping and update my wardrobe. Despite the recent cold chill there is a real feel of Spring in the air, and I haven’t been able to resist picking out a few pieces for the first sniff of sunshine! 1. Although Spring isn’t always warm enough to get your legs out, there are still some gorgeous long skirts for Spring out there. I love wearing brighter colours so that even through those April showers there is something guaranteed to brighten your days! 2. I absolutely adore this floral print blouse from George at Asda, I think that florals are so fitting for this time of year! In sizes 8-22 and at just £12.50, Asda has such a wearable and affordable range. This *may* have fallen into my basket this week! 3. I love packing my big Winter coat and wearing something lighter and brighter, and you really can’t beat a trench coat! I love this one from Lyst, they have an amazing range of trench coats to suit a wide range of budgets. I think you can’t go wrong with cream, it literally goes with everything! 4. 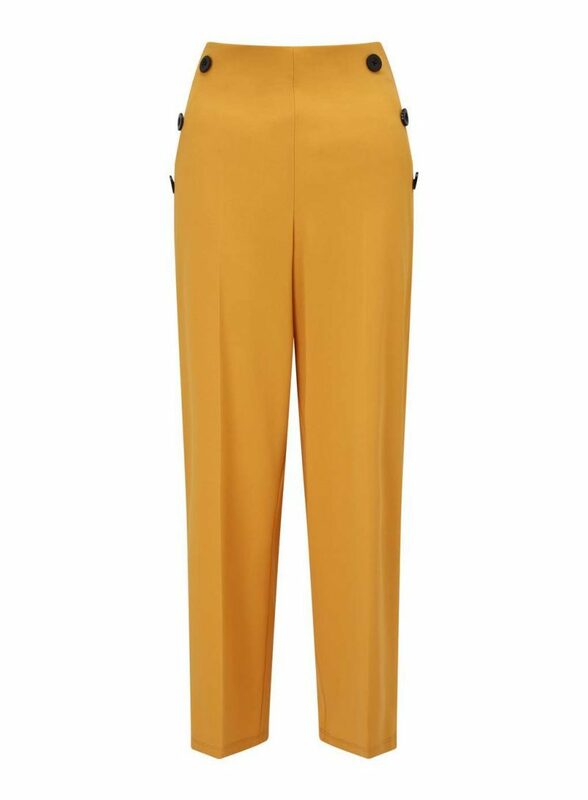 Another favourite for Spring is yellow, and I love these gorgeous cropped trousers from Miss Selfridge. With a lovely button detail, available in sizes 4-16, they are priced at £25 and can be dressed up or down depending on the occasion! 5. Every wardrobe needs a selection of white tops, I know Gaz never understands why one is never enough, and I love a Bardot top for versatility. This one from Dorothy Perkins is currently just £12.80 in the sale and will go with just about anything! In sizes 6-22 I’m looking forward to the warmer weather so I can get my shoulders out! 6. Is there anything better than storing away your winter boots for another year and slipping into some loafers? I admit I have more than one pair already, but I couldn’t resit these tan loafers from TU at Sainsbury’s. They are a real bargain at £18 and have a comfort sole which feels so good on your feet! So there you have it – my Spring essentials. Now we just need a little sunshine! Roll on Spring!! You can win a £50 Outfit gift card to spend at Miss Selfridge, Dorothy Perkins, Topshop, Topman, Burtons, Wallis, Evans and Outfit Kids! Simply enter via the link below, the winner will be chosen at random and notified via email at close of competition on 29th April. I really need to go through my clothes and add some Spring suitable pieces. I love the Bardot top, such a great shape! These are all great spring options. I like the Floral Print Blouse. The floral print blouse and the tan loafers are my favorites! I can’t wait to wear loafers, sandals, shorts and sleeveless tops! Thanks for sharing your spring clothing suggestions. I can’t wait for winter to be over! I am ready to see lots of spring flowers and springtime fashion. I agree! 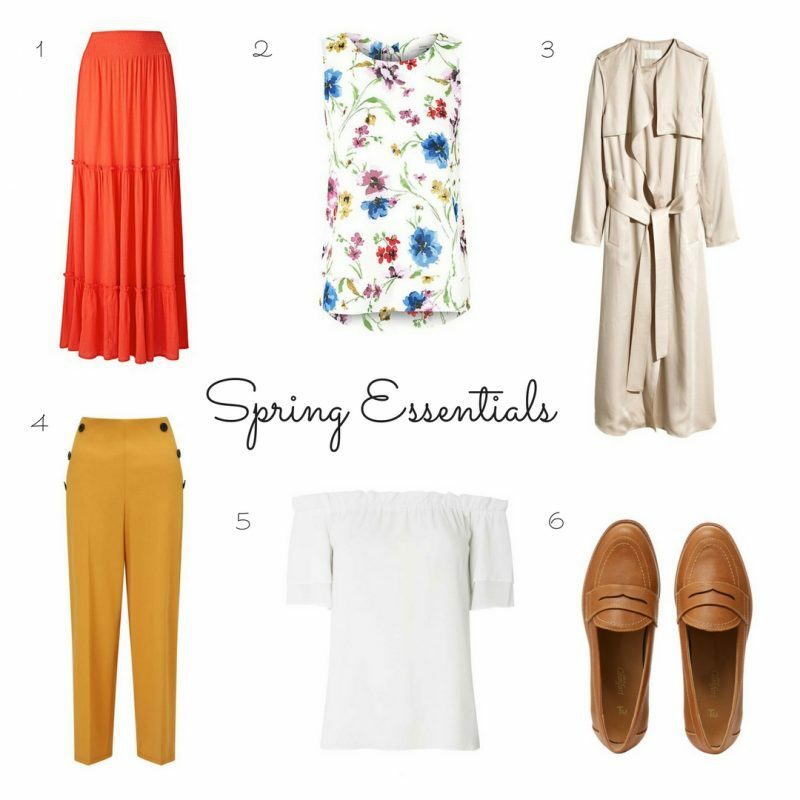 These are all definitely essential for spring, especially those cropped trousers. I am so glad spring is finally here and the cold weather is leaving. I love spring clothes way more than winter clothes! That floral print blouse is nice! I really need to go through my wardrobe to clean it out and stock up on spring clothes! although sadly it’s coming up to winter here! Oh I really like those bright mustard trousers! What a fab colour and cut. Love all of these selections, especially love the orange skirt and mustard trousers! I really do need to go through my wardrobe and get rid of some clothes to buy some new clothes haha! Oh these items are gorgeous! I love the yellow trousers and the floral top! They’re beautiful! Where is this spring you speak of? lol! No seriously, these are some lovely pieces. I could use a new wardrobe…! I love spring clothing, it’s always so light, airy and a welcomed change after a long winter. I love the colours that come through in spring. The floral blouse and yellow trousers are such lovely pieces! It is so crazy how nice Supermarket fashion brands are these days and George at Asda is no exception. I am loving the floral print blouse and the mustard trousers are very fashion forward as well. These are all perfect for welcoming the start of spring. Love all the items in your roundup, especially the yellow trousers. I don’t own that color yet! The floral print top is lovely – perfect for spring. Last summer I was heavily pregnant so my warm weather wardrobe needs a serious overhaul! I really like item 1, the orange skirt. It’s gorgeous. 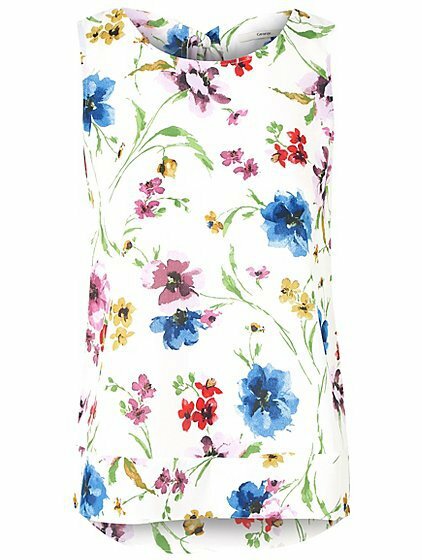 I love the floral top, it is so pretty and would go so well with jeans or 3/4 white shorts I have. Love the shoes. The color is also perfect to match with jeans! I can see wearing this with jeans and a white top. I didn’t know To have shoes like this. I like the Floral Print Blouse. My favourite is the floral print blouse. The Bardot top looks great and I could imagine wearing that over spring/summer. I also really like the loafers and think maybe it’s time to move out of my boots. I love the tan loafters! I like the orange skirt; but I’d have to cut about 2 feet off the bottom as I’m so short! I love the floral top! I can imagine wearing it all spring. Love the colour mustard perfect outfit for spring /summer ? I love the pretty orange skirt the most, so summery and comfortable looking. Love those Loafers – they’d look great with jeans! The Floral Print Blouse is my favourite. I love both the white top and the long skirt, they are making me long for the spring weather! I love the floral print blouse from George! It is so pretty for spring and summer! I like the floral print blouse. It looks so pretty and it’s so affordable which is great! My favourite item is the floral print blouse. I love the yellow trousers, but I’m not sure I could pull them off. My favourite is the Asda floral top, such a good price too. I absolutely love the cropped trousers! What a gorgeous shade! I love the mustard trousers, they would be great for work. I like the pretty floral print blouse. I love the floral print blouse – it’s so pretty! I love the cropped trousers, they are so stylish. I like the Floral Print Blouse the most. floral top is gorgeous and summery! my favourite! I love the mustard trousers! I really like the floral top … it would go beautifully with so many things I already own …. I absolutely love the floral blouse – it’s so eyecatching! I really love the Bardot top as the cold shoulder look is so flattering! I love the off the shoulder white top. Its lovely and summery. No. 6 the Tan Loathers actually caught my eye…they look so soft and comfy. I love the loafers, but I am yet to find a pair that don’t rub! I love the floral print blouse. Definitely my style and good price too. The Floral Print Blouse is very pretty. I love the floral blouse! I love the Miss Selfridge cropped trousers..they’re gorgeous! I love number 3, a great summer time smart or casual jacket! I think the cropped trousers are probably my favourite, although I like the flowery top too. I love the mustard coloured trousers! They would look lovely in the summer ? The yellow trousers – the colour is amazing! Lyst trench coat looks fab! I really like the trench coat and agree I can’t wait until I pack my big coat away for another year! I love the floral print blouse because it’s very pretty and fresh looking and would be perfect to take away on holiday. I love the floral blouse it’s beautiful ? I love the floral top and the orange skirt! I like the shoes. They look very comfortable. I love the white bardot top, you are right, one can never be enough! 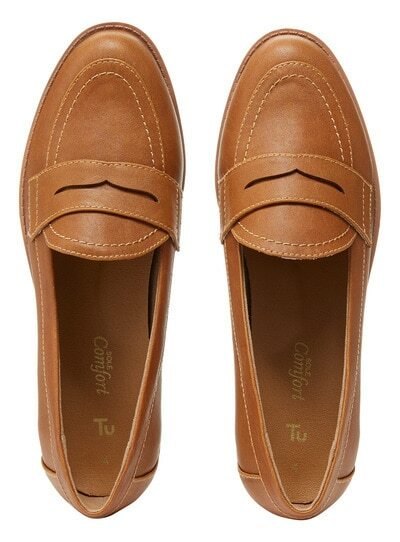 The tan loafers from Tu at Sainsbury look so stylish and comfy, I think these are definitely my favourite. I love the bardot top, mustard trousers and tan loafers. Great for work but too good for work!! We need some spring sunshine ? The floral blouse is gorgeous ❤Lovely to cheer me up after the awful weather we’ve been having! I love the trench coat! So happy to be ditching my big winter coat finally! l love the Floral Blouse from Asda, l love their flowery blouses they are always so light and summery and of course a fantastic price too!. I love number 1 – the long skirt. Perfect colour for spring but long enough to keep you warm in the wind! I love the entire outfit! The loafers are probably my favourite, because I love the tan colour and have wanted to buy a pair for so long ? I like the Floral print blouse, it’s perfect for spring. The bardot top is my favourite, it would go with so much! I love the floral print blouse. I love those loafers, they look really versatile. I really like the floral print blouse from george at Asda, because it looks perfect to wear on a nice spring day. The floral print blouse is so beautiful! I like the yellow cropped trousers the best – they would be very useful. Number 5, perfect for summer! Number 2 the floral print blouse. lovely items…love the mustard pants and would wear them with the white top and loafer shoes….love the trench coat too! I really love those trousers – especially the buttons up the side. I love the floral top from Asda as well! Even though I’m usually afraid of colour, I love those cropped trousers! The trousers are my favourite – they look beautifully cut. Number four, the cropped trousers are really beautiful. Perfect for spring days out. What a lovely selection. I particularly like the floral print blouse. My favourite is the flowery top? The bardot top! Loving that shape so much at the moment! I like the flowery top from Asda – looks great and is great value too! I love number one. It is not easy to find lovely skirts now for some reason. The trench coat is my favourite and then the skirt. I love the floral print blouse, perfect for home with jeans or at work with tailored trousers or a skirt! The floral print blouse from George at Asda is lovely, I’ll need to have a look at the clothes next time I’m in my local Asda. Loving the maxi skirt and the gypsy top! The cropped trousers from Miss Selfridge, I just love the colour, Amazing! I like the tan loafers best! The lovley pair of loafers would be just perfect! Stunning colour!! The long orange skirt is my favourite. the floral top from George love it! I love the floral blouse. It would catch my eye in a shop. Love the loafers- so cute! The floral print blouse is just my thing! I love the loafers! Sensible price as well, thumbs up! Loving the Dorothy Perkins white Bardot top! The floral print blouse would be so cute for work in the spring! I love no. 2 and 5. I’m guilty of wearing dresses all the time so would love to buy more tops with skirts and trousers. The loafers are my favourite item. Can’t resist new shoes! The loafers are such a great price but I love the floral top!